Etherdelta DEX launched by Zack Coburn in 2017 is a place where many people trade ERC-20 compliant tokens including Iconomi, Augur, 1ST, and others. The DEX’s smart contracts, like in any other DEX, use your private keys to access your Ethereum wallet and thus execute your transactions. Otherwise, the use is in full control, does not need an EthereDelta account, and that they deal with the counterparty directly. Etherdelta is less costly than some other DEX, with just 0.3% taker fee while it is free to withdraw, deposit and for maker transactions. The DEX picked because it was a place people could go in to trade tokens just coming out of ICOs before they hit major exchanges. That made it generate $10m in daily trading volumes. The volume has gone down since then as competition increased. First, you are also able to watch the daily volumes for each and every token by just accessing the website on the front. Page. On the bottom left hand, look for the “Volume” button and then scroll to find the volume of the desired token. You can also follow trades or recent transactions by checking the top right of the website. Transactions including deposits, withdrawals, exchanges, and trading are done via smart contracts once one integrates a personal wallet. Etheredelta lets users connect to wallets through MetaMask and other solutions. You do not need to open an account to do trades but only to integrate your wallet on the site. Once you get to the site, you are able to access most buttons needed to trade: wallet, order book, and price chart. Deposit button allows you to move funds from personal wallet to the exchange. The “New Order” feature located at the bottom center of the website allows you to input the amount of PPT you want to buy or sell. You can directly set the PPT/ETH prices for the new order and the expiration, then click on “Sell” or “Buy” to execute the trade. 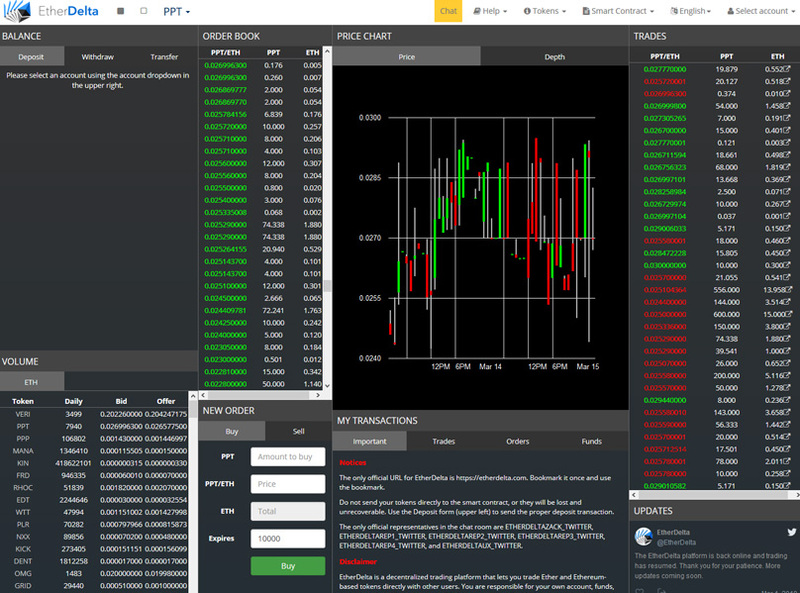 You can also use public tools to track your trading activity and funds. For instance, these include Etherescan.io for checking your transactions, ethgasstation.info to check your network load, etherescan.io/txsPending to check the count of pending transactions, Ethplorer.io to check your token balances and Etheredelta.com/trades.html to check your transactions. The fees for depositing ETH is 0.0003 ETH, withdrawing is ~0.0001 ETH same as depositing token, while withdrawals cost ~0.0002 ETH same as order cancellation. Apart from being decentralized, the exchange offers a wide range of token options to trade. You can also add tokens to the site quickly and easily, simply by inputting the necessary details and tokens. The exchange also lists tokens that are just out through ICOs before they can list on other exchanges, in addition to being an experienced DEX, and offer a wide range of token options for exchange. Etheredelta is a safe project although there was a scam site called Etherdelta. git where one victim lost $8000 to the scam site. The project also recently forked to ForkDelata project. which will also be offering decentralized trading and hosting, as well as a tokenized method of platform ownership. In addition to Zach Coburn, Tina Trinh is also part of the team running the project and they are influential people in the Ethereum community. Zach is a previous co-founder of Subvert and Profit, a social and marketplace; DormItem, which is a college classifieds site; and Madhens, an ad market. However, some of the complains include a complex interface, slow trades, and the fact that it supports ETH-based tokens only.